"Raises max MP by 1, and enhances magic and summon power. Sometimes deals powerful critical blows." Lock the Keyhole in Neverland. "Obtained in Neverland. Easy to handle with a formidable swing speed." 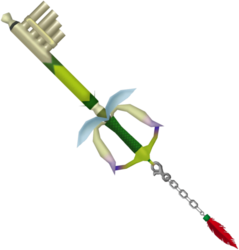 The Fairy Harp is a Keychain for Sora's Keyblade which appears in Kingdom Hearts and Kingdom Hearts Chain of Memories. In Kingdom Hearts, Peter Pan gives Sora the Fairy Harp once he locks Neverland's Keyhole. In Kingdom Hearts Chain of Memories, the Fairy Harp is the signature Attack Card for Neverland. The Fairy Harp's overall color scheme is reminiscent of Peter Pan's clothing. Its handle is dark green and the base of its guard is light green. The rest of the guard is comprised by two sets of wings, one white pair that create the sides of the guard, and one light blue pair above them. These wings are similar to Tinker Bell's. The base of the blade is dark green and the shaft is light green and rounded. The tips of the blade and the teeth are gold and modeled after Peter Pan's pan pipes. The Keychain has silver links and the token is the red feather in Peter Pan's hat. This page was last edited on 5 April 2019, at 15:10.